Advocates from Transportation Alternatives, The Project for Public Spaces, and The Open Planning Project join "Gridlock Sam" Schwartz and Enrique Penalosa to call for New York City to consider experimenting with some form of physically separated bike lanes in the near future. Featuring ample footage and photos from over a dozen cities worldwide, this video makes the case that America is woefully behind the curve in protecting its cyclists in big cities. Though this video is NYC-centric in nature, all lessons and video easily apply to cities across the U.S.
Posted in Bicycles. Tagged as "Gridlock" Sam Schwartz, Best Practices, Beyond the U.S., Bicycling, Enrique Peñalosa, Mark Gorton, New York City, Paul Steely White, Transportation Alternatives. Brilliant ! Looking at all the differing videos restores hope when cars have given one a really bad day ! Love it, we must, as riders put more effort into promoting these types of ideas. As a cyclist too, i understand this all to well in San Antonio and other Cities I Rode in. The concept of a seperated commuter bike lane is intriguing. I think there are possible applications in urban centers that would have synergistic benefits of reduced vehicular travel speeds, safer pedestrian crossings, as well as a safer bicycling experience. The one area I would suggest needs further exploration is how to accomodate bus transit-rich areas and the segregated bike lane. Bus Stops are place at sidewalk curbs in most cities. Would we have to design new bus stops with pedestrian refuge islands on the travel way? Might there be a way to do this without give up too much on-street parking? The road shown in this picture used to be a through road for cars, but now it's for access only. Residents can drive their cars along here to get to housing, but that's all. Much the same is done on streets which are busy with traffic. I wish they had this where I live. I almost got hit by a car yesterday! When I saw the film I feel sort of envy about how the city responsibly provided bike lanes for the cyclists. How I wished I were one of those people eagerly biking along the busy streets of NY. In the city I live, biking on the streets is a risky business because we do not have bike lanes. It's a matter of one's wit to arrive safely to each destination. I can only hope the city can provide us one someday. Nevertheless, I bike 90% of the times wherever I wish to go, for the sheer love of it. fantastic ideas! i love it. I'm living in Curitiba - south Brazil - and we have what we call "Ciclovias" inside the sidewalks, without contact by side with the streets, where there is a small space of grass between the street and the cycle-via. It's very safe and nice. Curitiba is one of the most modern capitals in Brazil. Here we got pioneers in articulated buses and other concepts. Great, now if in Madrid we could just get those "lame" painted lanes instead of nothing, it would be awesome. That was a well-done video with ample examples and visuals that help the viewer understand the concept of the types of bike lanes and the problems. I am against discriminatory bike lanes that prevent pedestrians, bicyclists and cars from intermingling. How can methods of transportation evolve if it can't communicate with other forms of transportation? In San Francisco, we have decided not to ask the government for separated bike lanes because ANY bike lane is better than no bike lane - contrary to the opening comments in the video. We feel that we should be natural people weaving in and out of lanes, mashing up against cars and kicking them away in a natural manner when they cross into our bike lane. Either that or we should get rid of all cars on all roads in the city. No compromise. Years ago, I worked at Rusk Rehabilitation Hospital (a part of NYU) with a wonderful young man who had been injured by a bike in a bike lane on 6th Avenue. The injuries were severe - - he had been a promising pianist and the accident left him with brain injury. He was unable to walk and had lost most of his speech and could no longer play the piano. Bike lanes in NYC that are not separated from pedestrians don't work. They make pedestrians terribly vulnerable. Anybody that doesn't believe that these bike lanes can work need to come to the Netherlands and become a believer. Do your research, you might even like riding your bike down city streets or the countryside. Trust me I live in the Netherlands and I certainly would not want to ride a bike in NY with all the dooring and pushing by cars. But in the Netherlands I often ride my bike. You can also check youtube what cycling in the Netherlands is like. I do think it is important to make a distinqtion, on slow traffic lanes we do not have separated traffic lanes(20 mph), but on faster lanes (30 mph and above) we do have separated lanes. We also have bike lanes without any car lanes in the coutryside, just for commuting between towns. Kind of like a bike highway. Some people are right intersections are problems, but on busy intersections we have either bike traffic lights, a roundabout with clear signs on which has priority(mostly cyclists) or an underpass/overpass for cyclists. It is clear to everybody that the intersections are the most dangerous place, thus everybody is checking if everybody is following the rules. This makes it more safe. Accidents do happen, but very rarely and almost always with cars or bikes running red lights. It is always wise to check that everybody is following the rules before crossing and to follow the rules yourself. But in the Netherlands cycling is as safe as walking down the street. I my opinion cycling in NY, DC or LA would be great if only their were good facilities. If it is fast people will use it, because cycling has a lot of benefits, like it is cheap and can be faster than a car in a city. I love how at 2:35 to 2:38 you can see the cyclist ignoring the red light and cruising across the intersection. Now what if more streets around residential neighbourhoods had these? Thanks @John (OK, 2 years ago, but this is still a vital issue) for mentioning "Effective Cycling". Who's gonna plow the separated bike lane? What a cluster@#$ the intersections are. The separated lanes are filled with pedestrians. (runners going the wrong way, homeless people with MOUNTAINS of returnable cans...). It's a noble effort and does _some_ good, but it's not the only answer. why not have a look at what have been done in China for bicycle lanes. We have green buffer in between bike lane and vehicle lane. I live in Eugene which has been consistently touted as a great city for cycling, but which in reality has no actual network of safe cycling paths. There is one lovely one around the river, and another which travels along the west Eugene wetlands. They are widely separated. For actual commuting or other similar practical purposes of traveling around the city there is no safe system. 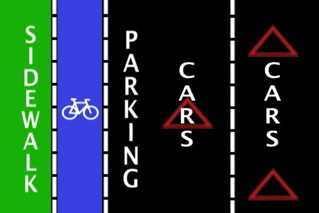 Most so-called bike paths are actually the safety zone for parked motorists to enter and exit their cars, so they are between parked cars and moving traffic. There are also some painted paths between lanes of moving traffic. What we do have is a lot of hot air about what a great place it is to cycle. I suppose it's all relative in that it's probably better than Texas. Americans...hoping you all are supporting and will urge your congressman to co-sponsor U.S. H.R. 4722, the Active Community Transportation Act. Our Boston suburb area in particular has had over a 60% increse in bicycling since 2000. Some of you may know there are plans taking shape to have bicycle sharing(similar to Montreals system) installed in Boston thks to Mayor Menino... it's great idea but my fear is that navigating Boston can be a dangerous proposition for your average uninitiated bicycle rider until proper bike lane infrastructure is put in place. We need this legislature to get the ball rolling. In places where bicycle commuting and riding has flourished, infrastructure has been put into constant focus. Until Boston does some of these things the bike sharing initiative will literally be cart before the horse and be asking for accidents to happen which will endanger the initiative. 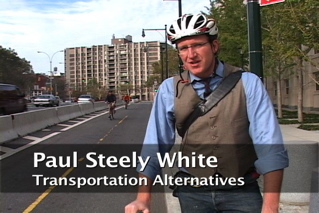 Please ask Congress support this bill which asks for $2Billion in funding, the construction can also be a great stimulus for our communities and will only benefit and inspire so many people in urban pollution zones who have have the opportunity to commute, and would do so if safety were better. Electric bicycles are coming to America as well... but we need safer roads for them, lest this good thing becomes just a lucrative feeding ground for lawyers. Saw the short video here about Copenhagen...it is fantastic. This situation really is a field of dreams scenario, build the infrastructure and they will come...our comunities will benefit and become a better and safer place to get out and enjoy. Spring is coming...write your congressman today! A lot of specialists tell that mortgage loans aid people to live the way they want, just because they are able to feel free to buy needed stuff. Moreover, some banks present auto loan for different persons. Hopefully, your video will get lots of city planners considering more options. The comments here are also real food for thought. Fort Wayne, Indiana has a few painted bike lanes - with no buffer - on some streets. The downtown lanes look like they will only tempt cyclists who want to play Russian Roulette with the long line of parked-car- doors. We really don't have many cyclists in our city, considering it's size. Fortunately, we do have an attractive and extensive Rivergreenway Bike Path system ( http://bikepath.eftisland.com/html/ picture_galleries.html ) that runs for 20+ miles along the banks of 3 rivers out of sight of auto traffic. And there are other bike path projects in the works. i just added you to digg ! enjoy your fresh traffic and comments! in minute 05:11 he says "cars do drive pretty quickly down the street" - well, so You have to change this! In Austria the speed limit in cities is 30 mph. Right now there is a discussion going on to even reduce it to 18 or 15 mph. This would affect traffic safety positively, but won´t have a dramatic effect on average speed, because most of the time of their travelling time cars spend in congestions just standing on the streets anyway. Great post! Its all up to city planning to make this work. Bicycle lanes are a tremendous problem in my town. Every driver parks his car on the bike lane, and you have nowhere to go except the street, with all the cars.